2 How did my child get diaper rash? Diaper rash is a generalized term indicating any skin irritation (regardless of cause) that develops in the diaper-covered region. Synonyms include diaper dermatitis (dermatitis = inflammation of the skin), napkin (or “nappy”) dermatitis and ammonia dermatitis. While there are a several broad categories of causes of diaper rash, contact irritation is the most common culprit. 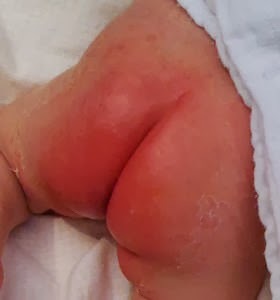 While diaper rash is generally thought to affect infants and toddlers, any individual wearing a diaper (for example, an incontinent adult) is a candidate to develop this dermatitis. Wetness.Even the most absorbent diaper leaves some moisture on your child’s skin. And when your child’s urine mixes with bacteria from his stool, it breaks down and forms ammonia, which can be very harsh. That’s why children with frequent bowel movements or diarrhea are more prone to diaper rash. Although a child left in a dirty diaper for too long is more likely to develop diaper rash, any child with sensitive skin can get a rash, even if his parents are diligent diaper changers. Chafing or chemical sensitivity. Your child’s diaper rash may be the result of his diaper rubbing against his skin, especially if he’s particularly sensitive to chemicals like the fragrances in a disposable diaper or the detergents used to wash a cloth diaper. It could also be that a lotion or powder you’re using at diaper time doesn’t agree with your child’s skin. New foods. It’s common for children to get diaper rash when they start eating solid foods or are introduced to a new food. Any new food changes the composition of the stool. (The acids in certain foods, such as strawberries and fruit juices, can be especially troublesome for some kids.) A new food might increase the frequency of your child’s bowel movements as well. If you’re breastfeeding, your child’s skin could even be reacting to something you’re eating. Antibiotics. Children on antibiotics (or whose breastfeeding mothers are on antibiotics) sometimes get yeast infections because these drugs reduce the number of healthy bacteria that help keep yeast in check as well as the harmful bacteria they’re meant to destroy. Antibiotics can also cause diarrhea, which can contribute to diaper rash. The best way to prevent diaper rash is by keeping your baby’s skin as dry and clean as possible and changing diapers often so that feces and urine won’t irritate the skin. If you use cloth diapers, rinse them several times after washing to remove any traces of soap or detergent that can irritate your baby’s skin. Avoid using fabric softeners and dryer sheets even these can irritate the skin. Proper skin care is one of the most important treatments for diaper rash. The following techniques may help alleviate or shorten the duration of diaper rash. Diapers should be changed more often than normal. Skin should be washed with a very mild soap and air dried or lightly patted dry. The skin should be cleaned, but avoid any rough scrubbing, which could lead to further skin irritation. After cleaning, the skin should be exposed to air, leaving the diaper off for several hours if possible. Avoid using plastic pants during this time. Certain foods may seem to worsen the rash. If this is the case, avoid these foods until the rash has cleared. If the rash is caused by a contact or allergic dermatitis, stop using any new soaps or detergents that may be causing the rash. If the rash appears to be caused by a candidal infection, it may be treated with topical, over-the-counter antifungal creams. Topical steroids can be used for diaper rash caused by allergic, atopic, or seborrheic causes but should not be used for fungal infections. Zinc oxide may also be effective.